Recent figures published by the European Environment Agency have showed extremely promising figures on municipal waste management across the EU. Malta has come a long way since the days of landfills such as Maghtab, and has registered both positive and negative outcomes since acceding to the EU in 2004. Data published in the SOER 2015 report have showed further positive changes in Europe’s consumption patterns. Such patterns are directly linked to economic production, and despite the recession of 2008 European countries are still shifting towards a less waste intensive lifestyle. Even though the statistical analysis factors in a 7% increase in household expenditure, total municipal waste production decreases globally by 2%, or 5% per capita more specifically. 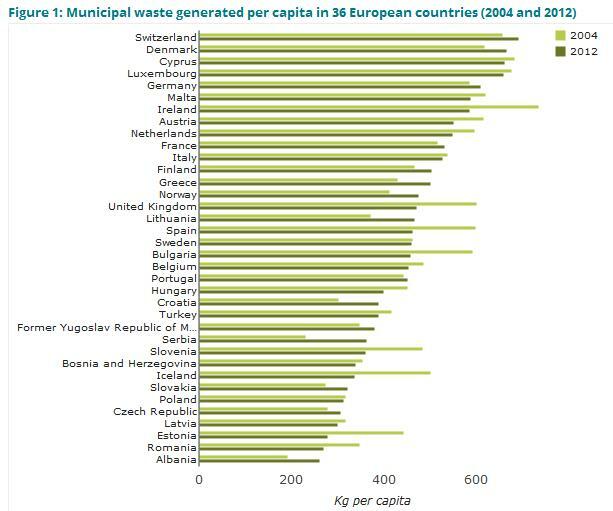 Switzerland, Denmark and Cyprus registered the highest municipal waste generation per capita in 2012, while Romania and Albania ranked the lowest. This is to be expected as the data provides a reflection of factors such as economic prosperity and population density. In fact, the three smallest EU states (Malta, Cyprus and Luxembourg) ranked in the top six. Even though Malta still ranks high on this list, it is producing 33 Kg per capita of waste less since 2004. This is very promising news for Malta, especially if you consider the fact that the number of tourists visiting the island increases every year. This is very significant in light of the fact that 1.7 million tourists visited Malta in 2014, equivalent to five times the local population. Therefore, despite the increase in visitors, Malta is becoming more efficient in its waste management. As dictated by the Waste Framework Directive, a target for 50% recycling of municipal waste by 2020 has been set. 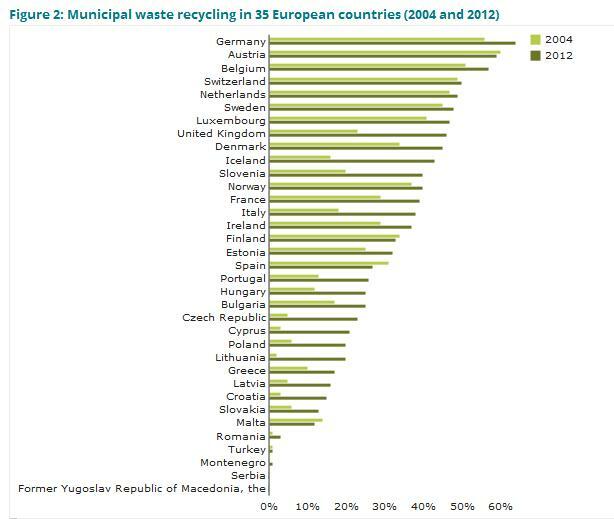 On average, EU countries recycled 29% of their municipal waste in 2012, 7% higher than in 2014. This is due to environmental policies pushing for covering material recycling, composting and digestion of bio-wastes. Germany, Austria, Belgium and Switzerland managed to recycle over 50% of their municipal waste in 2012, and countries such as the United Kingdom, Italy, Slovenia, Lithuania, Cyprus and the Czech Republic registered an increase of over 18%. However, Malta has recorded a 2% decrease in recycling rates over this eight year period. Despite this, one should consider that prior to 2004, Malta dumped all of its waste in the uncontrolled sites of Maghtab and Qortin, which were closed in 2004 and replaced with the Engineered landfills in Ghallis and Ta’ Zwejra. Things are moving at a more sluggish pace in Malta, but the achievements garnered so far are commendable nonetheless. This data is a clear indication that Malta desperately needs some form of National Recycling Strategy. A study conducted in 2011 by Frank Bezzina and Stephen Dimech support the findings by the EEA, as the three main factors that affect the participation of the public in recycling practices are ‘personal recycling attitudes’, ‘norms and skills’, and ‘satisfaction with service provided’. The latter factor is a crucial area in which the government can invest and grow, so such a national strategy would be beneficial in addressing these three factors and tipping recycling figures in Malta to the positive end of the scale.